Oh no definitely not mine......... but for my best friend RACEL. She bought a domain name (http://racelyn.com) the other day at 1and1.com, where i bought mine too and she was really excited about it. It costs only $5.99 a year and Yebba congrats to her. She forwarded h er domain name in just a snap by just following the simple tutorial that I made. You can see my domain tutorial HERE. Her blogspot blog got a PR3 and i told her she will loose that Pr once she made it a domain name (like what happened to my domain too) and she told me it's just ok for her bec. she can't make another blog. 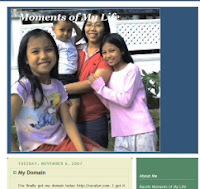 Anyway, i hope you can take a peek at her domain blog "MOMENTS OF MY LIFE". thanks bes for the support :-) and advance happy birthday! tuloy tayo ha!